Size is relative. 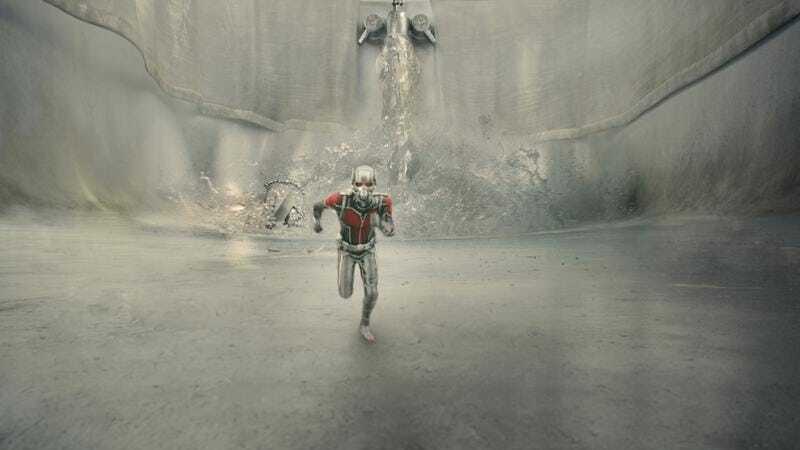 Just as a bathtub can look like a coliseum from the perspective of a pint-sized superhero, a box-office hit can look suspiciously like a miss to a studio used to dwarfing its competition. Ant-Man, the latest franchise hopeful from the moneymakers at Marvel, opened at No. 1 this weekend, just like the 11 movies that preceded it. But at $58 million, it also fell a little short of Marvel’s expectations; that’s chump change, after all, for a company with the Avengers on its payroll. When you deal in inflated expectations and record-breaking smashes, your sense of proportion can get a little wonky. Marvel was doubtlessly hoping, if only in secret, for a surprise box-office coup on par with the one Guardians Of The Galaxy pulled last summer. Like Ant-Man, that enormous hit gambled on the profitability of characters that make Hawkeye look like a household name. Guardians had Chris Pratt, outer space, and “Hooked On A Feeling” going for it. The similarly jokey Ant-Man banked on Paul Rudd and won, just not as loudly and proudly. Anyone crying flop is making a mountain out of an anthill, and forgetting that Marvel just convinced a decent number of moviegoers to see a film about a guy who can make himself really, really small and talk to ants. Speaking of relativity and people who have worked with Paul Rudd: Though it opened to about half as much business as Ant-Man did, the Judd Apatow rom-com Trainwreck is being treated like a surprise hit, as its $30 million intake is both more than what folks were predicting and pretty high by the standards of Apatow comedies. (Of the director’s films, only Knocked Up scored a bigger debut.) Credit there almost surely belongs to star and writer Amy Schumer, who’s having a very good, very visible year. But her burgeoning popularity wasn’t enough to topple those pesky Minions, whose first starring vehicle edged out Trainwreck for the number two spot on the box-office charts with another $50.2 million. The animated spinoff is now at $216 million—more than Inside Out managed in the same amount of time, though optimists with good taste are holding out hope that a warmer reception will help Pixar stave off its crasser competition. In the comparably microscopic arena of art-house moviegoing, the week’s big success story was Mr. Holmes, starring Ian McKellen as an aged Sherlock Holmes. The film’s $2.9 million might seem downright infinitesimal when held up against the earnings of even a modest Marvel hit. But that’s the thing about perspective: An ant-sized indie can become a man-sized triumph when it’s not forced to measure up to Hollywood’s latest army of Hulks.